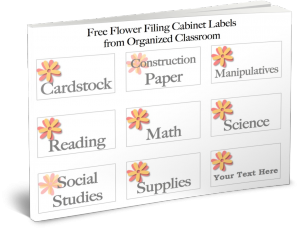 Classroom Freebies Too: Free Flower Filing Cabinet Labels! Free Flower Filing Cabinet Labels! Have you digitized your paper files? What will you do with your now empty filing cabinet? I actually store construction paper and cardstock in mine! Since I was making the flower labels for the drawers anyway, I threw together a freebie for you to enjoy if they will match whatever project you might be working on as well. Want your own FREE filing cabinet labels?